So the school Christmas parties are over and kids are on Winter Break starting today (I'll be sleeping long after this appears online)! Here are some teacher gifts we made and sent this year. It was fun to find out a few people share in the same tradition I do each year -- and that is to make Spiced Christmas Tea for gifts. Check out Michelle Wooderson's version here and Anna Wight's version here. Anna packaged hers in a good sized jar that I liked and she so kindly shared where she found them -- WalMart in the canning section. These are wide-mouth Ball pint (16 oz.) canning jars. I liked that they were squatty, easy to fill and about $5 for a 4-pack. Each year I struggle with how to package my tea and Anna found the perfect solution, I thought! 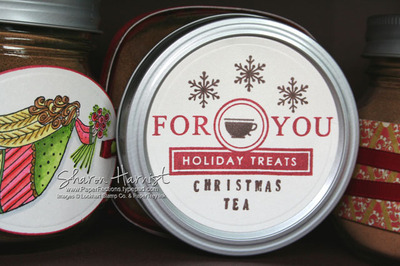 The jar lid label stamps are from PaperTrey Ink's Holiday Treats. This set is so incredibly versatile . . . I love that the center is blank and you can customize it any way you wish. I stamped the "For You" in Brilliance Pearlescent Poppy; the tea cup, snowflakes & "Christmas Tea" (Karen Foster Snap Stamps) in Brilliance Pearlescent Chocolate. It is also cut with a Spellbinders Nestabilities Classic Circle. I colored the angel and stamped the lid label to coordinate with the 1.5" strip of Webster's Pages Candy Cane paper I wrapped around the jar. Red grosgrain ribbon & glue dots help hold the angel image on the jar. The bottom label on the jar was also handmade. I followed Cindy Lyles' easy instructions and printed them in a circle format onto shipping labels and scalloped punched them out. That makes it easy to just peel the label and stick it to the bottom of the jar! So if you've read this far, I'll gladly share my Spiced Tea recipe . . . it seems Anna, Michelle & my recipes vary somewhat!